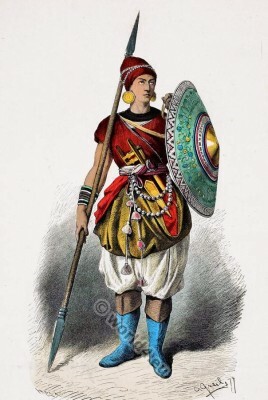 Home » India spearmen costume 15th century. Medieval military dress from India. The warrior is armed with a spear, shield and various daggers. Artist: Alois Greil (1841-1902), Hugo Kaeseberg, Wood-engraver (1847-1893). “Sheets for costume design: historical and folk costumes. Published by Franz Lipperheide, 1876-1887 Berlin. This entry was posted in 1450, 15th Century, Asia, India, Middle Ages, Military and tagged India military uniforms, Lipperheide, Weapons on 6/25/13 by world4.